I’m making available below, free to read online, the full text of Chapter 2 of my new novel "War God: Return of the Plumed Serpent". In this chapter Tozi, the young heroine of my story, a witch with the power to make herself invisible, secretly observes the Mexica prince Guatemoc, who she hopes to win over to the cause of destroying the evil emperor Moctezuma. Man-Eater was a bad loser. This was the fourth time he’d been spectacularly bested in less than an hour of sparring, and now he growled furiously and attacked again, his blade a blur of rapid movement, too fast for the eye to follow. Yet somehow Guatemoc evaded him, his lean, scarred, heavily muscled body weaving from side to side, ducking and swaying as he retreated before the furious onslaught until suddenly – Tozi could not see it coming – he swivelled, let his opponent slide by, and chopped the edge of his blade into the back of Man-Eater’s thick neck, reducing the force of the blow but yet allowing it to strike home with a loud slap that laid out his friend, face down and inert in the dust. Invisible, insubstantial as air, able to pass unseen wherever and whenever she wished, Tozi was the silent and unknown observer of the bout. Indeed, she had observed Guatemoc many times since Moctezuma’s plot to poison him, when she’d used sorcery to save him and to bring him healing for the terrible wounds he’d received in battle against the Tlascalans. It was, she had to admit, most inconvenient that she had fallen in love with this noble prince, nephew of that noxious creature Moctezuma, who for the entire fifteen-year span of Tozi’s life had been enthroned as the Great Speaker of the malevolent empire of the Mexica. But having accepted the truth of her feelings, Tozi supposed she was better able to deal with them. Above all else, a dalliance of any kind was out of the question. Guatemoc was of the blood royal, while Tozi was a witch and the daughter of a witch. Besides, he was her enemy and the nephew of her enemy. She must use her magic and her wiles to turn him against his uncle and the war god Huitzilopochtli, ‘Hummingbird’, whom his uncle served – either that, or she must bring Guatemoc to the same ruin she planned for Moctezuma. Quetzalcoatl, the Plumed Serpent, god of peace, ancient antagonist of Hummingbird, was coming, coming as prophesied in this year One-Reed, to overthrow a cruel king and abolish the war god’s vile cult of human sacrifice forever. Tozi felt a momentary qualm – for her own magical powers, most particularly her ability to render herself invisible, had been enhanced by none other than Hummingbird himself when she had stood before his altar of sacrifice. Her friend Malinal, who had stood there with her that night two months before, and who had been freed with her following Hummingbird’s intervention, had seen a terrible danger in this. For if Hummingbird had freed them from sacrifice at the hand of his puppet Moctezuma, then it must mean the war god had a plan for them and, since Hummingbird was a being of pure evil, then it followed that only evil could come of it. And so she had sent Malinal off on a perilous journey to her homeland, and to her family who had sold her into slavery with the Mexica – sent her off to seek out the returning god of peace. Tozi’s magic was strong now, stronger than it had ever been, but still she had no idea what had happened to her friend in the sixty days or more that had passed since then. She could only guess, could only hope, that she was well and that her mission to find Quetzalcoatl, and lead him back to the city of Tenochtitlan to overthrow Moctezuma, had been crowned with success. Meanwhile Tozi’s own business was here with Guatemoc. To win him over to the cause of the Plumed Serpent would be a great victory, yet Tozi could barely trust herself to approach him. Indeed, since the last time she had shown herself to him in her disguise as Temaz, goddess of medicines and healing, the very thought of him was enough to make her dizzy – for then the prince had swept her up in his arms and kissed her full on the mouth, and she had tasted his tongue and he had tasted hers. Even now, observing him unseen from the sanctuary of her invisibility, the memory made her breathless. Dressed only in a simple loincloth of plain white cotton, Guatemoc had been sparring with his friend Tecuani – nicknamed ‘Man-Eater’ – in the spacious courtyard of his townhouse in the royal quarter of Tenochtitlan. Both men were armed with macuahuitls – swords of hardwood stripped of their razor-sharp obsidian teeth for today’s purpose – and both their bodies were sheened with sweat. Presently, however, Guatemoc was on his feet while Man-Eater lay face down on the ground, a livid red welt standing out on the back of his neck where the prince had struck him. Now Guatemoc was seriously concerned, shaking his friend by the shoulders, getting no response. ‘A draw it is,’ replied Guatemoc with another easy laugh, and they both stood, slapping each other on the shoulders for all the world like two schoolboys reconciled after a playground fight. His life force was back. And, by dint of much exercise and determination, his strength had returned. But no! Not that! Though she felt a sweet heat in her loins, she would permit him no contact with her. She would not repeat the same mistake she had made before. There would be no contact, only spoken words. Perhaps even tonight, after Man-Eater was gone, after the servants had retired to their beds, she would find Guatemoc alone and win him to her cause. 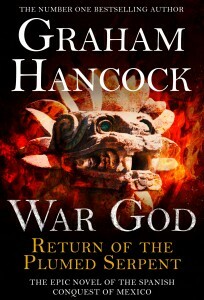 "WAR GOD: RETURN OF THE PLUMED SERPENT" was published on 9 October, 2014 in the US and the UK and on 9 December in Canada. Your support for my work as a writer both of fiction and non-fiction means a lot to me. Volume 1 of the series, "War God: Nights of the Witch", was published in 2013. 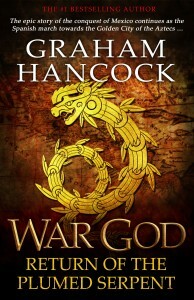 Various purchase links (Amazon UK, Amazon US, Amazon CA) and background materials are available on this page, and also on the War God official site: War-God.com. 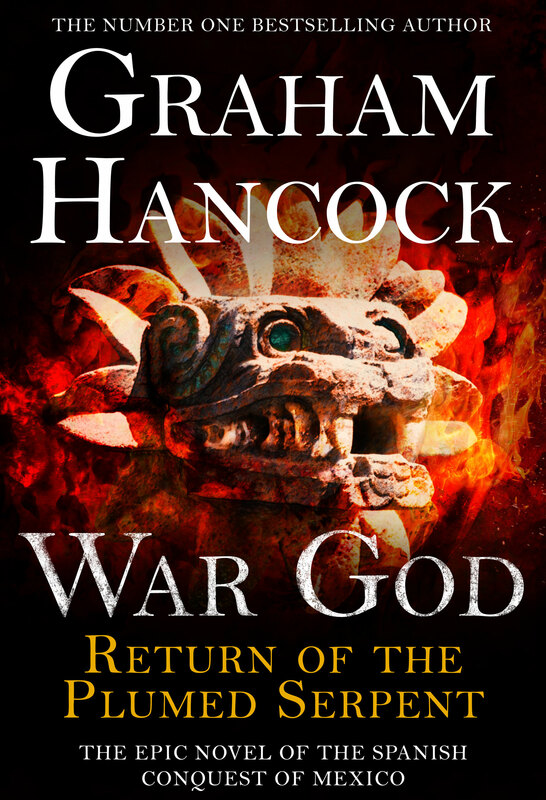 I’m making available below, free to read online, an extract from Chapter 28 of my new novel, "War God: Return of the Plumed Serpent". In this extract, the Mexica Emperor Moctezuma, believing himself protected by warding spells cast by his sorcerer Acopol, overcomes his fears of being magically attacked and ventures out from the safety of his palace to officiate at the festival of Tecuilhitl held each year amongst the ancient pyramids of Teotihuacan. The festival is supposed to culminate in mass acts of human sacrifice but the witch Tozi, the heroine of my story, aims to disrupt the ceremony. She has the power to make herself invisible and stalks Moctezuma awaiting her moment of vengeance. His confidence grew. He was relieved that no magical attack had been attempted on his person. Acopol’s warding spells were clearly so powerful that they protected him even here. Moctezuma yawned, licked his lips and handed the empty goblet to a retainer. The time was approaching when, as age-old tradition demanded, he must mingle with the public. Normally it was forbidden for any mere mortal to have contact with him, who was so close to the gods, but today,Tecuilhuitl, that taboo was lifted for the single hour before noon. Teudile stood ready with the basket of cacao beans and silver trinkets that the Great Speaker would distribute as gifts; after that was done, he must perform the ritualised slow-stepping dance of the star-demons in a special costume of green quetzal and red parrot feathers before the sacrifices could begin. Dismissing the little shadow of apprehension that lingered at the back of his mind, despite his attempts to reassure himself, Moctezuma stepped out into the sunlight and walked with dignified steps, Cuitláhuac at his right, Teudile at his left clutching the basket, across the boundary of cleared space that separated him from the masses. A hundred soldiers specially selected for their intimidating size had already surged forward into the crowd, opening a lane through which Moctezuma could pass and yes – ghastly thought! – the paupers would be permitted to reach between the guards to touch the Great Speaker’s garments, his hands, and even his gold-slippered feet. He shivered in disgust and progressed into the armed gauntlet. As he did so, complete silence fell. This was partly a matter of custom – silence had always been required at this moment – but it was partly, also, because the people pressing in all around were utterly, unspeakably terrified. As well they might be, Moctezuma thought. As well they might be. After all, a veritable god walked amongst them, who could order the death of any or all of them with a single, simple word, who could require them to cut their own throats right here, right now, who could command that their children’s brains be dashed out, or wrest their wives or their husbands from them at his whim, without any recourse on their part. Uggh … His flesh crept at the stinking smell that invaded his nostrils as thickets of filthy hands stretched out towards him, past the guards, grubby fingers clutching his robes, caressing his hands and arms. Others snaked out at ground level in order to reach his feet. And all these unwashed limbs and digits that so urgently sought for him belonged to people – his people! – who fervently believed that this fleeting connection would cure their ills, bring them wealth, make them fertile and fulfil whatever other hopes and dreams sustained them in their short, ugly, meaningless lives. Moctezuma was now twenty, now thirty, paces into the throng. The guards were having some difficulty keeping the crowd back. Better get on with it! He reached into the basket that Teudile carried, scooped up beans and silver jewels and began to pass them out, now to the left, now to the right, revolted at the massed hands that took them from him like so many hungry, grasping mouths. ‘Never!’ Moctezuma yelled. It was the charge of cowardice that got to him, and he could not restrain himself from responding even as the bodyguards rushed him, Cuitláhuac and Teudile into a tight group, pushing them through the screaming masses and back behind the cordon of troops protecting the pavilion. At the last moment Moctezuma turned and shook his fist impotently at the throng, only to feel a sudden inexplicable stab of pain. He looked down and saw that a gaping wound from which the royal blood gushed forth like a river had opened between his great and his first toe, slicing up from there towards the arch of his foot. ‘Witchcraft!’ he yelled – for at the moment he was struck, no one had been standing close enough to him to inflict this wound – ‘Witchcraft!’ He staggered and, as Cuitláhuac rushed to support him, he fell in a dead faint. Well, thought Tozi, that was a good start. She was grimly pleased with herself, especially because she had managed to stab the Great Speaker – not fatally; she did not want to kill him; she had long ago been persuaded by Huicton’s arguments about the merits of keeping him alive and using his own folly and weakness of character to undermine Mexica power, rather than getting him out of the way and making room for a stronger man to take the throne. To inflict that rather nasty injury on the royal foot, she had of course been obliged to allow her right arm and her hand holding the flint knife to materialise for an instant from the field of invisibility with which she had surrounded herself, a risky manoeuvre because of the possibility of detection; but she had done it so fast she’d got away with it. Now, with cries of ‘witchcraft’ going up all round, Cuitláhuac and Teudile leaping here and there like headless toads, armed guards storming back and forth, Moctezuma flat on his back, unconscious and bleeding from an inexplicable stab wound, and the huge crowd on the verge of a full-scale riot, she had every reason to hope that matters might spiral completely out of control. In the event, however, and within the hour, Mexica discipline and the judicious use of terror contained the crisis. Not a single member of the crowd was allowed to leave. After recovering from his faint, Moctezuma was patched up – weeping like a baby – by the royal physician. And Teudile announced that theTecuilhuitl sacrifices would go ahead. Tozi had eavesdropped the conversation between Moctezuma and Cuitlahuauc that had preceded the announcement. Predictably the craven Speaker had wanted to return at once to Tenochtitlan and to his palace – the only place now, he was convinced, that he could be safe from magical attack. We’ll see about that, thought Tozi. ‘We’ll see about that too,’ thought Tozi.